Home Again: Smiles from Today! Cutting up and freezing a fresh flat of home-grown Strawberries. This hot car got my attention at a red light signal. What era does this represent? Finding therapy in my garden. Oh, what beautiful bounty of fresh produce! Yum! I think there is something to smile about every day...but I see you found many things yesterday! Fresh produce...good music and friends...sunshine...munchkins...and interesting ways of getting around...all good reasons to smile. Looks like you had an eyeful of things to make you smile. I'm smiling at these photos. 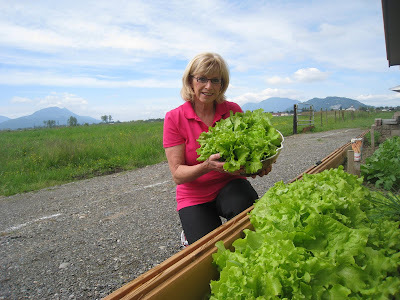 Oh the lettuce is so beautiful and the help in the barn is perfect. I enjoyed your post. We all need to look around and smile at our blessings. This is a beautiful time of year and the fruit is beautiful! Marg, you have a wonderful crop of lettuce! And a wonderful crop of grandsons too! Keep smiling. Wish I was nearby to snitch a few of those strawberries from you! Not sure about the picture...were the shoes on the wrong feet? Marilyn Monroe/John Kennedy/Frank Sinatra era car. I saw one one the road here with a "Kennedy for President" bumpersticker. Maybe that doesn't register with Canadian humor, but I thougt it was so cool!